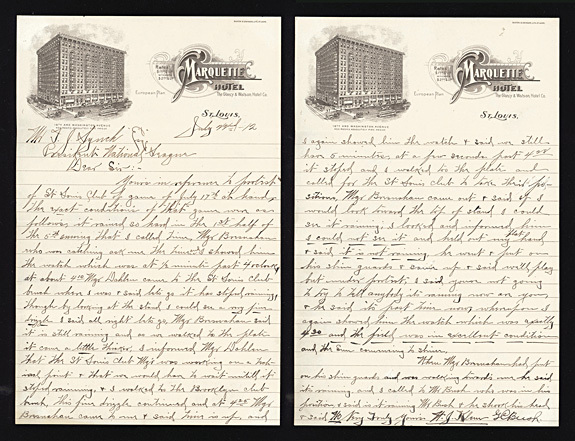 Last week a protested game letter written by Boston Braves manager George Stallings in 1916 was withdrawn from Robert Edward Auctions’ 2011 Spring sale under suspicion that it originated from the Baseball Hall of Fame’s famous ”August Herrmann Papers” archive. On their website REA states the letter was, “Withdrawn from auction due to possible title issue.” This week, two more letters suspected stolen from the Hall of Fame have also been identified in REA’s current auction and on EBAY. Lot 1027 in REA’s 2011 Spring sale is a protested game letter written by Hall of Fame umpire Bill Klem to National League President John Heydler on June 22, 1920. In January, this same letter was identified as item 49 on Haulsofshame.com’s “Halper Hot 100 List,” featuring stolen items which once resided in the collection of deceased New York Yankees partner Barry Halper. 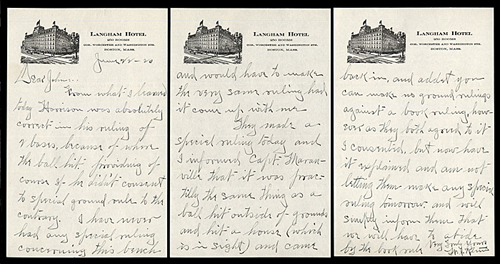 On EBAY, seller “jerryjersey” is offering another protested game letter written by Bill Klem to National League President T. J. Lynch on May 30, 1911. 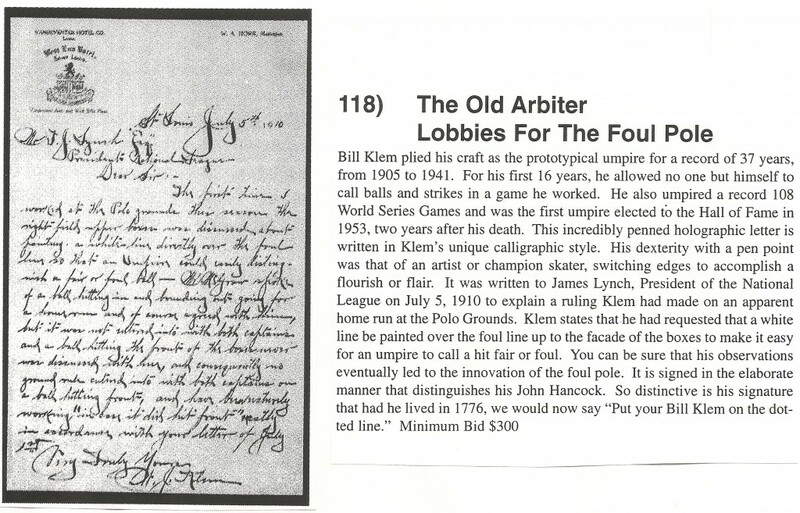 The seller claims that the EBAY Klem letter is the “earliest known” letter written by the Hall of Fame umpire. The National Baseball Library file for that game currently includes additional protest letters from the Chicago and Pittsburgh teams including documents executed by parties involved in that protested contest. The “Protested Games” files of the Herrmann archive include the testimony of players, managers, spectators and umpires which were presented by the National League to August Herrmann, the Chairman of Baseball’s National Commission, for rulings on the protested games. This May 30, 1911 protest letter written by Umpire Bill Klem is being sold on EBAY but appears to have originated from the Hall of Fame's collection. This 1920 protested game letter written by umpire Bill Klem originated from the HOFs "Herrmann Papers" archive. Additional letters written by Klem to NL Presidents regarding protested games have appeared for sale at auction over the past few decades. None of the auction offerings have ever identified the origin or provenance of the Klem letters. The most recent appearance was of a 1911 letter from Klem to NL President T.J. Lynch that was offered for sale by Coach’s Corner Auctions last month. 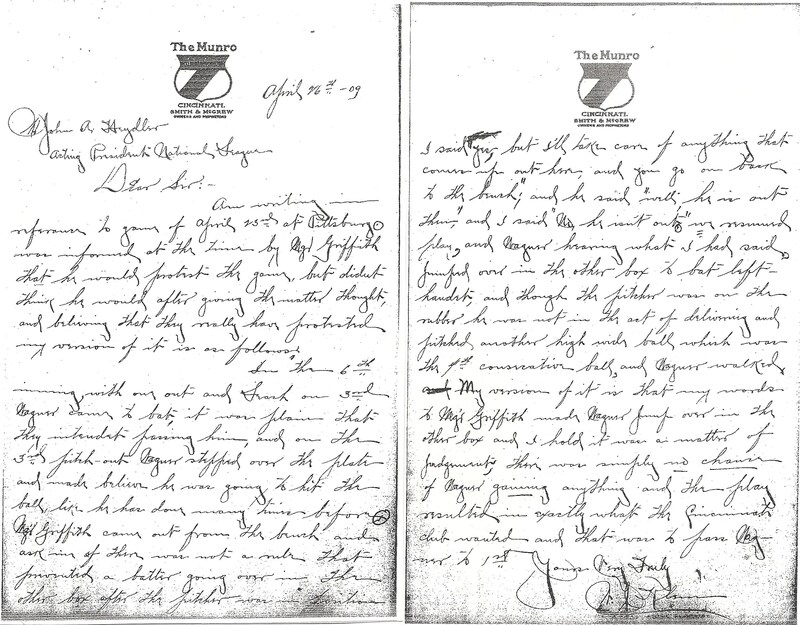 The letter was dated May 30, 1911 and pertained to a protested game between the Pirates and Cubs played on that day. The “Herrmann Papers” archive at the National Baseball Library contains a file of documents dedicated to this game located in “Folder 13″ of “Box 44.” Klem’s letter appears to be missing from that file. This letter written by Bill Klem and recently offered by "Coach's Corner" appears to have originated from the HOF's August Herrmann Protested Game files. The current REA Bill Klem letter offering was previously sold in 1999 by Sotheby’s on Amazon.com as part of the Internet portion of the sale of the Barry Halper Collection. 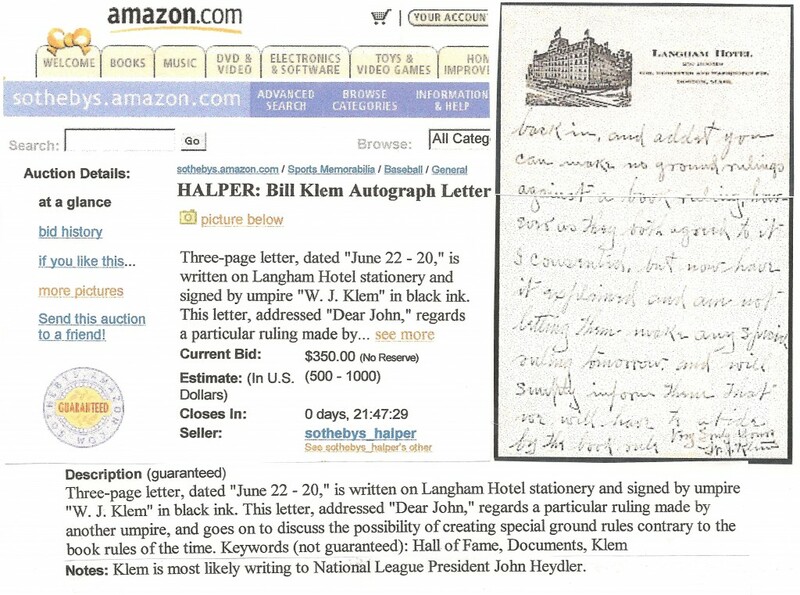 The 1999 Halper sale featured several other letters that originated from the Herrmann archive including examples written by Hall of Famers Christy Mathewson, Hughie Jennings, John McGraw and Fred Clarke. REA’s president, Rob Lifson, was Sotheby’s head consultant for the live and Internet auctions of Halper’s collection and this is the second time he’s handled the suspect Klem letter. The 1920 Klem protest letter currently in the REA 2011 sale was previously sold as part of the Barry Halper collection by Sotheby's in 1999. This Klem protest letter appeared in Mastro Auctions' 2006 sale. 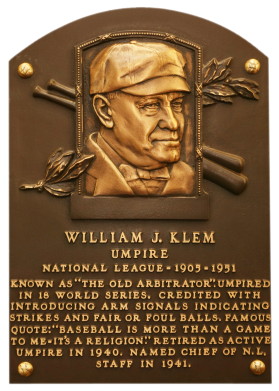 In 1998, Mastro Fine Sports sold another Bill Klem protest letter related to a game played between the New York Giants and Boston Braves on July 7, 1910. This Klem letter should be included in the “Herrmann Papers” archive files for protested games. The letter is missing from “Box 44, Folder12,” which is dedicated to that particular protested game. This Bill Klem protest letter should be in the HOFs file for a protested game between New York and Boston on July 7, 1910. The letter, addressed to NL President T. J. Lynch, was sold at auction in 1998. 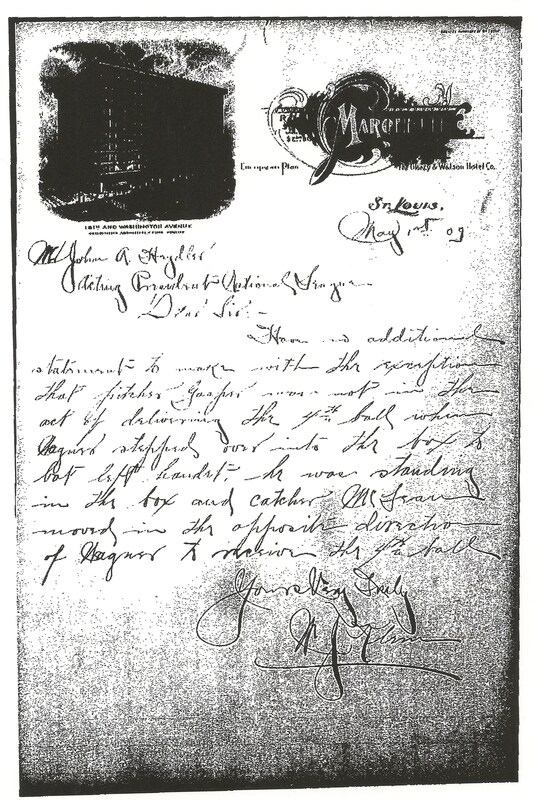 Despite the confirmations that many items have been stolen from the National Baseball Library and their awareness of the missing protested game letters, the Baseball Hall of Fame has neither investigated nor established a legitimate source for these protest documents which have been offered for public sale. This Bill Klem letter is still located in the HOFs Herrmann archive. Another Klem protest letter currently in the Hall of Fame’s collection is addressed to NL President John Heydler and dated April 26, 1909. 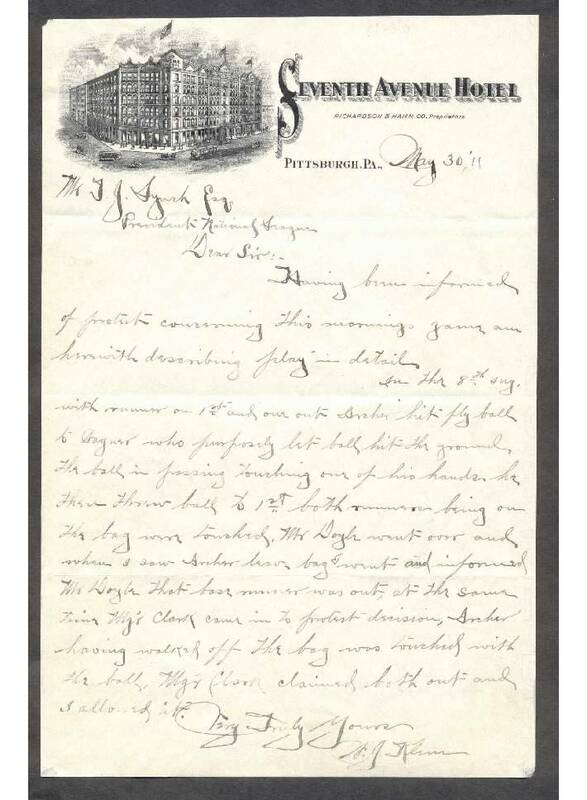 The letter deals with a protested game played on April 23rd between the Pirates and Reds and is currently found in “Folder 6, Box 44″ of the Herrmann Papers archive. This Klem protest letter is presently found in "Box 44, Folder 6" of the Herrmann archive. 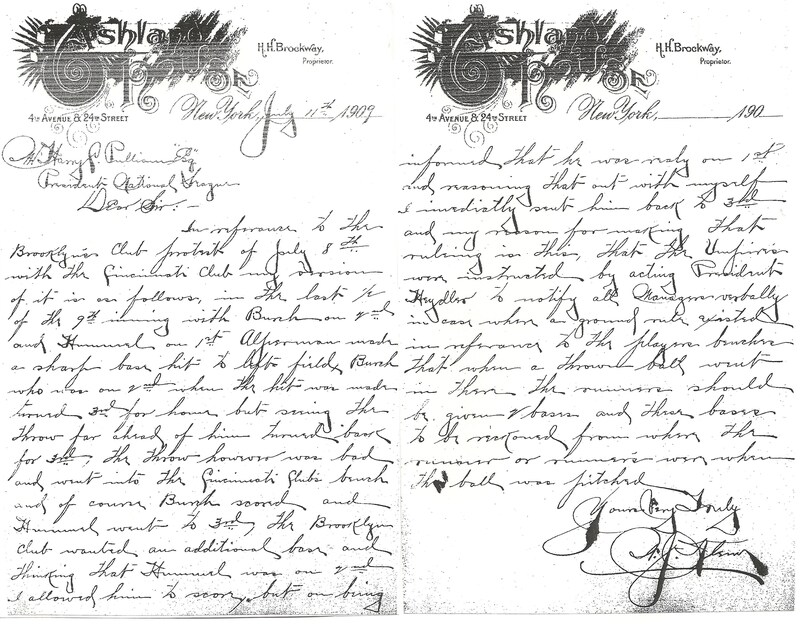 Another Klem letter (below) from May 1, 1909, is currently found at the National Baseball Library in “Box 44, Folder 6,” in a file dedicated to a protested game between Pittsburgh and Cincinnati on April 23, 1909. 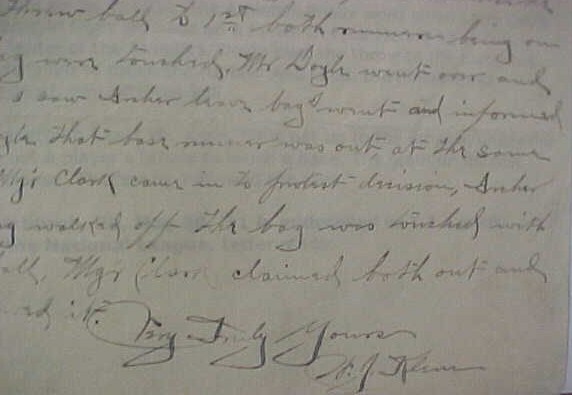 In September of 2009, the Baseball Hall of Fame was presented with a lengthy report prepared by this writer illustrating how documents likely removed from their Herrmann archive were being sold in the collecting marketplace. Most recently letters addressed to August Herrmann have been sold by Clean Sweep Auctions and EBAY, while another protested game letter was sold by Coach’s Corner. To date, Hall of Fame officials have not issued a public statement regarding the thefts and the sales of suspect documents. They have also not issued a formal statement as to what action they are taking to investigate and recover items offered for sale. If the Bill Klem letters currently being offered for sale are withdrawn from the REA and EBAY auctions, they will be the latest two of thirteen items to have been identified and pulled from auctions in the past year. Heritage Auction Galleries of Dallas, Texas, withdrew letters written by Hall of Famers Fred Clarke, Joe Tinker, Charles Comiskey, Ban Johnson and Ed Barrow, while REA withdrew sworn affidavits related to a protested game in 1908 played by the Chicago Cubs. Although these documents were withdrawn from auction, sources indicate that none of them have actually been returned to the Baseball Hall of Fame. Hall officials have declined to comment on the withdrawals and have not responded to questions as to whether a late 1980s FBI investigation into the Cooperstown thefts has been re-opened. The Baseball Hall of Fame declined comment for this article. UPDATE: The 1911 Bill Klem letter offered on EBAY failed to sell and has now been relisted at a discounted price. All these letters coming into the market place in such a short period of time indicates that it may all be coming from the same consignor. It’s past time that REA steps up to the plate and exposes the consignor. This is not the time to protect the consignor, it’s time to expose the consignor which will determine if they are the thief. If not the consignor can expose their source. Time for the collecting community to put pressure of REA, Coachs Corner, Heritage and Clean Sweep. Don’t bid in their auctions till they cooperate with the hobby. They are selling stolen goods with sealed lips. As time goes by, it is getting worse and worse and it is a damn shame, that REA, ETC. dont have the ,in plain english, balls, to say where it is all comming from. But, then on the other side of the coin, it could be a inside job and they all are in cahoots with one another.Then, there is the possibility, that it all came from the Halper collection and then , you cant chase a dead person.In all, this sounds like a murder mystery and ” WHO DONE IT “, is the question, with many involved. I agree, if the auction houses are not part of the solution they ARE the problem. this is beyond ridiculous. Can the auction houses be this ignorant and the hall of fame this careless? It would be great if everyone just bade up these items on Ebay until they were unsellable. Reductio ad absurdem! Sadly, the trend is that items will continue to surface, auction houses continue to accept and market them, and then they offer their best impersonation of Captain Renault from Casablanca (“I’m shocked,shocked to find that gambling is going on in here!) and simply pull the item as if they had no more responsibility in the matter. If auction houses were as serious as they would like collectors to believe about ethical conduct, they would screen items against a profile of sourcing that has been provided here and other places and decline to accept consignments that fit the profile. As much as I enjoy seeing these issue brought to light, I have become resigned to the notion that nothing will change until change is mandated by forces outside the hobby/collectables industry. I am no longer holding my breath that that day is on the horizon. From personal knowledge, stolen property do end for sale on the site. Case in point, in August of 2006, my family and I suffered an apartment fire. I had 80 autograph baseballs stolen after the fire only to turn up for sale on EBay, 18 infact. I had a detailed list of all the baseballs. I could only get back 9. Ebay didn’t follow through on my complaint. So, it doesn’t really surprise me.